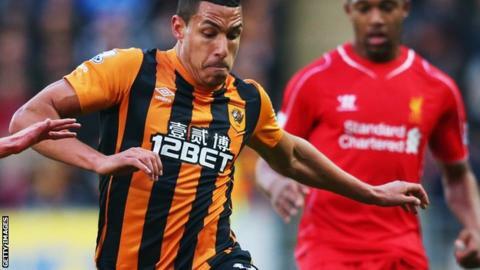 Hull City midfielder Jake Livermore has been suspended by the Football Association and his club following a positive test for cocaine. Midfielder Livermore, 25, joined Hull for £8m last June from Tottenham. "The club has suspended Jake Livermore pending further investigations to be made by the Football Association and our own internal disciplinary procedures," a Hull statement read. Livermore, who has one England cap, has played 39 times for Hull this season. His international debut came in a friendly against Italy in August 2012. Players who test positive on match days for illegal 'social' drugs - as opposed to performance-enhancing drugs - can face up to a two-year ban under FA rules. The FA confirmed a player had failed a drugs test but did not name them. A statement read: "In line with its anti-doping regulations the FA can confirm it has issued a provisional suspension to a participant following a positive test for a prohibited substance." Prior to signing for Hull permanently, Livermore spent the 2013-14 season on loan at the KC Stadium and has had loan spells at MK Dons, Derby, Peterborough, Ipswich and Leeds. When he joined Hull, Livermore signed a three-year contract, with the club holding an option for a further 12 months. Steve Bruce's side are 18th in the Premier League, the last relegation place - two points behind Newcastle and Sunderland and three points adrift of 15th-placed Leicester. They travel to Tottenham on Saturday (15:00 BST) before ending the season with a home game against Manchester United on Sunday, 24 May.